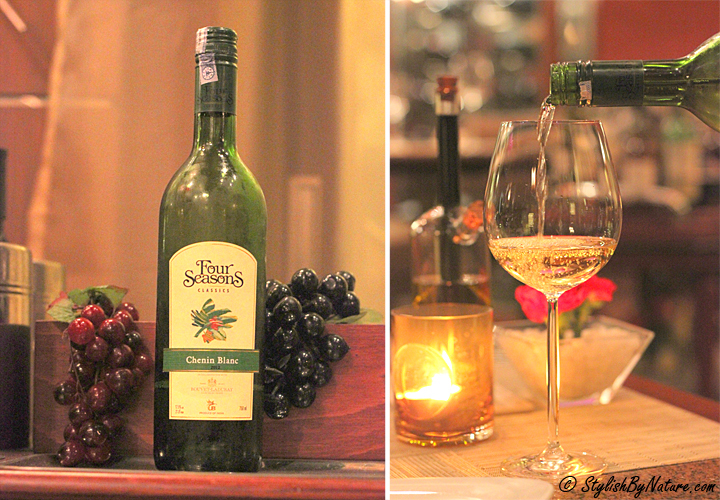 Four Seasons Wines has organized a great campaign where Food and Wine join hands to create a Gourmet Indulgence. Where top chef's have created a cuisine which will prepare your palette to enjoy wines and provide ultimate gourmet experience. 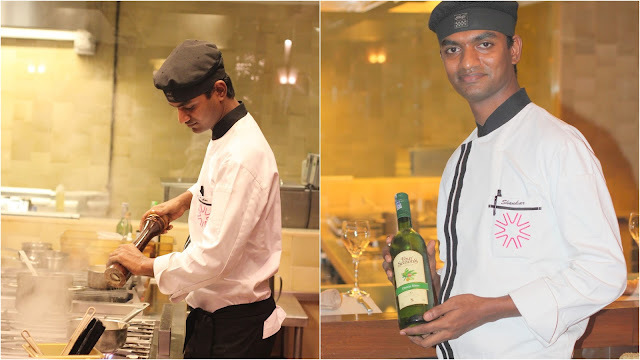 We had a great 3 course dinner organized at Vivanta by Taj,Graze for Gourmet Indulgence. It was raining heavily and we were stuck in traffic for sometime before we reached Graze, but all our nerves were relaxed by checking the ambiance of Grace, staff was really friendly and were making sure of our convenience. Lady at front desk escorted us to our table. Rohit as usual got busy enjoying ambiance and to capture it. Being Prawn lover, we both ordered prawn for starters, they had medium spices which were bringing out the taste of prawns, white wine with its crisp acidity and bit of sweetness worked well with spices of prawns. For main course I ordered Salmon with pan fried mushrooms in cointreau sauce. Salmon was cooked well, but had an overpowering fish taste which was taking over the taste of mushrooms. Red wine with soft velvety tannins was working good with Salmon. Rohit is always lucky with his choice of menu and I often think i should wait till he orders. Chicken was awesome and risotto was really working well with chicken. Anyways good for me I enjoyed chicken as well, Rohit enjoyed both red and white wine with chicken. Oh my my, we are already full and here come the deserts we ordered Caramel Tart for me and Home made Vanilla ice cream with Graze twist for Rohit. And you guessed it right Rohit's choice win again and this time I moved my Caramel Tart to Rohit and started eating Vanilla ice cream. 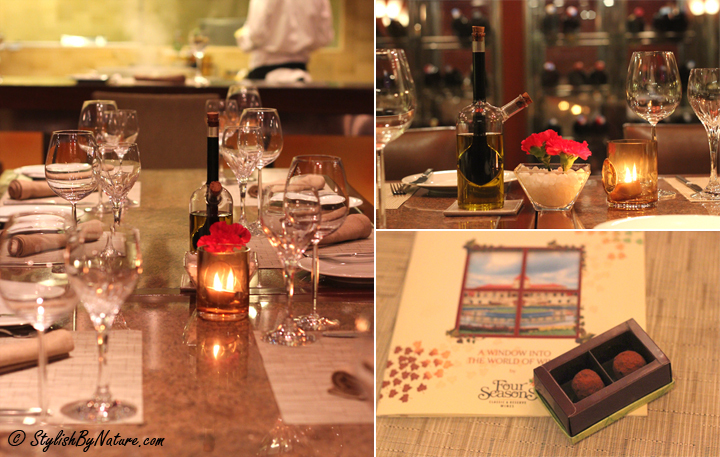 Finally a great evening came to end, we had Great Food which was paired with Awesome Four Seasons Wines, truly a Gourmet Delight. Lovely post, the pictures are beautiful!! this looks like an amazing dinner! nice photos, everything is so classy and those foods looks so yummy! Such an amazing dinner! Everything looks so delicious! Everything looks so yummy..including u..!LOL..! Btw..m following u on gfc n bloglovin, hope u follow back. Oh those plates look incredible. I definitely enjoy dining out like that and exploring new flavors and combinations. The melon drink looks yum, but so does the entire wine pairing. I need to do this some time.